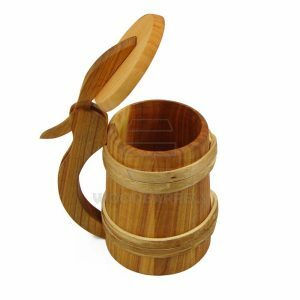 Wooden Beer Mug is a hand-made fairly large, roughly cylindrical, drinking cups. They are made using the traditional techniques of the European cooper masters, following the tradition across many generations. Old fashionable beer mugs of characteristic ‘churn’ shape are similar to those from middle ages and that makes them antique in style. 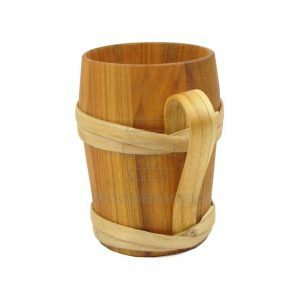 Like the earliest tankards, our wooden beer mug is made of wooden staves, similar to barrels. It has two wooden hoops, and a handle. A special ecological brewery wax is used inside. This creates a sealed layer inside the beer mug preventing unwanted direct contact between the beer and the wood. Therefore they’re meant to be used for cold drinks only. Our wooden beer mug is water-tight. 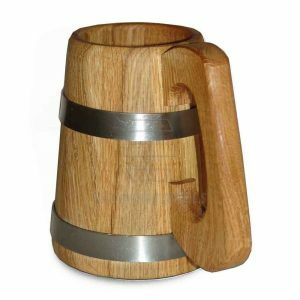 Oak beer mugs are hand-made using the traditional techniques of the European Cooper Masters, following a tradition across many generations. Old fashionable mugs of characteristic ‘churn’ shape are similar to those from middle ages that makes them a bit antique in style. A special ecological brewery wax is used inside, which creates a sealed layer inside the mug preventing unwanted direct contact between the beer and the oak wood, therefore they’re meant to be used for cold drinks only. All the mugs are Water-tight. 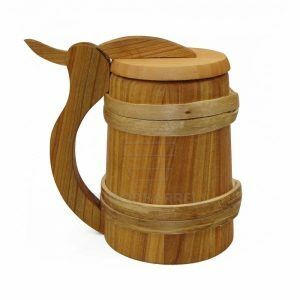 Wooden Beer Stein with lid is a hand-made fairly large, roughly cylindrical, drinking cups. They are made using the traditional techniques of the European cooper masters, following the tradition across many generations. 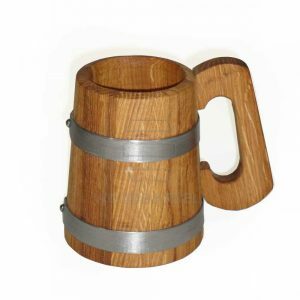 Like the earliest tankards, ours wooden beer stein is made of wooden staves, similar to barrels. They have two wooden hoops, a single handle and a lid. Old fashionable Wooden Beer Stein of characteristic ‘churn’ shape are similar to those from middle ages and that makes them antique in style. A special ecological brewery wax is used inside. This creates a sealed layer inside the beer mug preventing unwanted direct contact between the beer and the oak wood. Therefore they’re meant to be used for cold drinks only. Our Wooden Beer Stein with lid is water-tight. 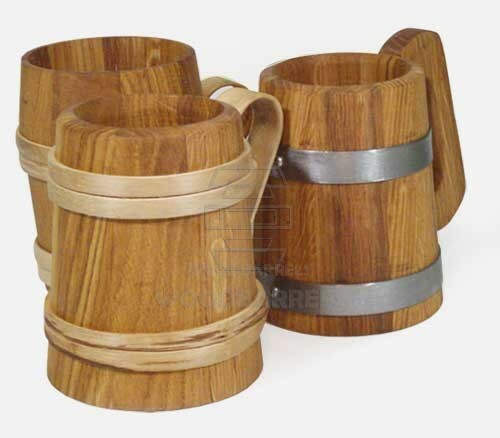 Wooden Tankard with steel hoops is a hand-made fairly large, roughly cylindrical, drinking cups. 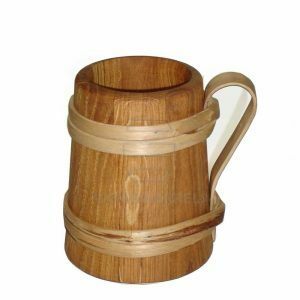 The word “tankard” originally meant any wooden vessel and later came to mean a drinking vessel. They are made using the traditional techniques of the European cooper masters, following the tradition across many generations. 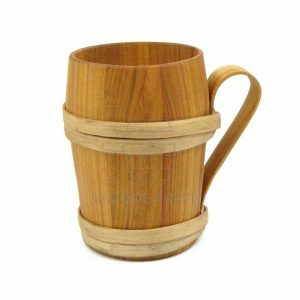 Like the earliest tankards, ours are made of wooden staves, similar to barrels. They have two steel hoops and a single handle. Old fashionable beer mugs of characteristic ‘churn’ shape are similar to those from middle ages and that makes them antique in style. A special ecological brewery wax is used inside. This creates a sealed layer inside the beer mug preventing unwanted direct contact between the beer and the oak wood. Therefore they’re meant to be used for cold drinks only. Our wooden tankard with steel hoops is water-tight.